For most of my life, if asked to describe my father, I would have talked about his accomplishments. Today I believe he was a teacher who valued people and truly cared. “Leadership is who you are, not what you do,” observed Frances Hesselbein, the former CEO of the Girl Scouts of America and founder of the Frances Hesselbein Leadership Institute. With my father’s death, this idea came to life: The values you live are who you are. Those values made him a great administrator from the very beginning. In 1962, Frederick Hovde, President of Purdue, mounted a national search to identify someone who could build a first-class mathematics department at Purdue University. When offered the job, Dad said, “If you want a first-class department, you need to make a commitment now that I can hire people this year without any interference. A department begins with people.” In his first year, Dad added 21 mathematicians to the department. All of whom loved math and cared about teaching. Dad taught and mentored hundreds of students and faculty over the years, and their success was his greatest pleasure. Louis De Branges, Edward C. Elliott Distinguished Professor of Mathematics at Purdue University, pulled me aside in 2006, when Purdue was naming a building after my father. He said, “Your father made sure I had what I needed to do great research, and that nothing got in my way. Your father is a mentor, a coach, and my best friend. No one else has ever done so much for me.” As he spoke, I kept thinking of how my father had come home glowing and proud in 1984. Louis had come to his office to tell him he had proved the Bieberbach conjecture. My father was the first person he told. My father always said that his job was to make sure Purdue had the best people and they were set up to win. My brothers and I remember his playing duplicate bridge with each of us. For a while, he was using three different bidding systems (a weak no trump for Richard, the precision club for me, and standard American for David) to play to our individual strengths. He did this for about 6 years. I cannot remember one time when he used the wrong bidding system with me. When he was with me, he was focused on me. My father had seven grandchildren, and a unique relationship with each. For example, he wrote a proof with my daughter Violet when she observed a pattern in numbers. None of her teachers at Horace Mann had time to sit with her and think through what caused this particular pattern, whether or not it had been identified before, or whether it could be proven. Her grandfather did. Brian, a 29 year-old grandson, brought cards to the hospital, 120+ miles from home, to see if my father could help with a card problem. He did. My father’s caring, passionate engagement with others even extended to politics. 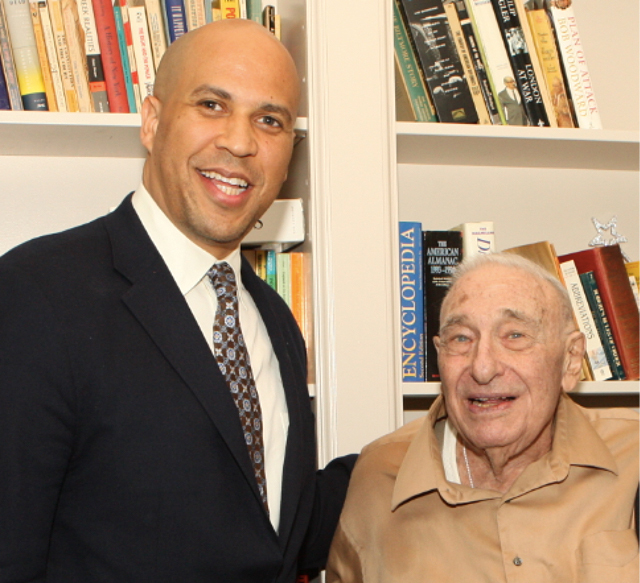 A few months ago, at the age of 92, he attended a fundraising event for Cory Booker. They talked for a long while, each discovering a kindred soul in the other as my father shared his concerns about the values and sense of empathy he felt needed to passed on to the next generation – for their sake and for our country’s in general. After the social portion of the event, Booker spoke for half an hour, spending about a third of that time talking about his conversation with my dad. He stressed how impressed he was with how much my father cared about people and about his country, and most of all by the fact that even at his age, he’d felt the need to come and speak with his state’s Senatorial candidate in person, rather than simply sit by and bemoan the status quo. But that was my father’s essence: he actively cared — about his family, his students, his colleagues, his fellow citizens, and his country. And at every level, he did what he could to make things better.